I first has 'The City' published as a print in 2002. I'm surprised after all these years that people are still wanting it, so I've has the original old transparencies that we used to print from made into a digital format and for the first time have made this image available in a small size, meaning it can be purchased in aready made frame at a great price. This is the image that almost has become iconic in itself and that really began my journey as an artist. I’d been mucking around painting some streets near my home when I decided to build up a whole city picture using different eras. The first was the state house street, then the colonial homes, then the arts and crafts bungalows, the city and even an art deco street. Before I started painting I’d been making patchwork quilts and I can still see the influence of that design approach in my work. It wasn’t until the painting was finished that I realized I might have produced something a bit bigger than just something fun for our wall at home. 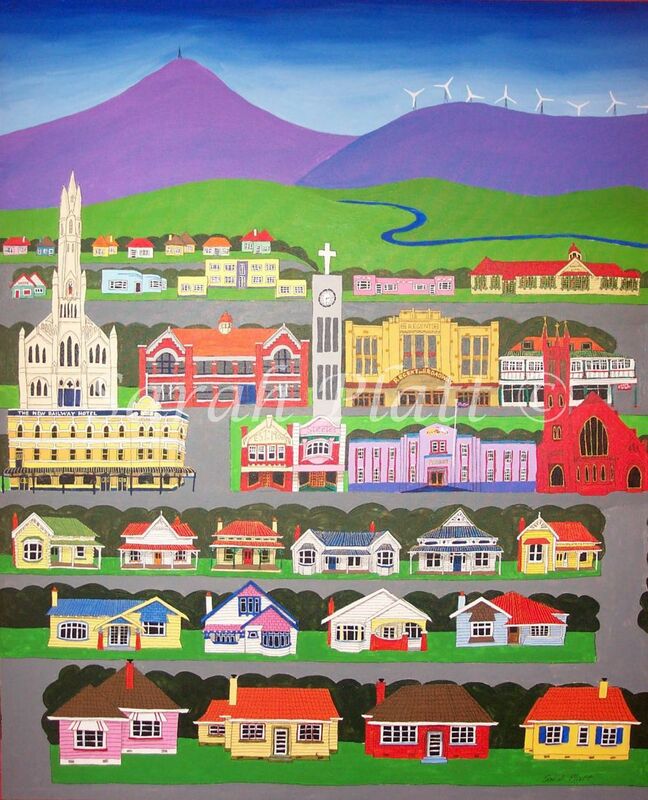 There had never been paintings of Palmerston North like this. I approached Trisha Cameron at Streets Ahead with this and three other paintings and asked if I developed it into prints, she’d think they would sell. She encouraged me to give it a go promising to buy the first ones produced. It was an expensive process taking them to print, but the public took to them like hot cakes. This image has become the symbol for my journey as an artist.